This post is adapted from a talk I gave at Adam Gilad's event The Boldness Code in Las Vegas on Superbowl Sunday. 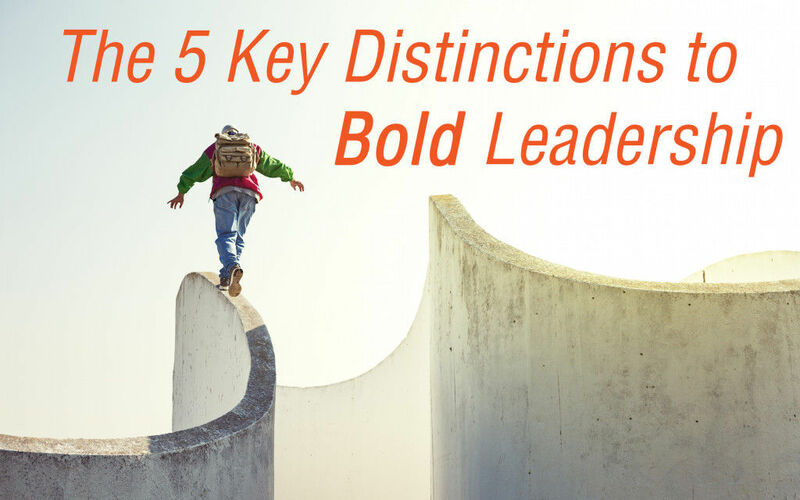 Originally it was called The 5 Key Distinctions to Living a Bold Life, but then I had an opportunity to submit the article to Fast Company and I changed it to be more leadership focused. Enjoy and let me know what you think! One of the key tenets of leadership is taking responsibility for your decisions. Taking that a step further, and into bold leadership territory, requires being the author of your overall experience in life. Just as a fiction author creates not only the characters in her novel, but also the context and environment for each plot twist, so must the bold leader look beyond roles and responsibilities to include holistic considerations like diet, nutrition, lifestyle and exercise as key components enabling the practice of bold leadership. For any aspect of your overall life experience that isn’t consciously curated, you risk becoming a victim of circumstance. The way to truly author your own experience is to control as many of the variables as you can proactively, so you spend less time in reactivity. Bold leaders embrace the idea that their status quo is one of constantly pushing beyond their comfort zone. When your default action is to rehearse your upcoming speech one last time, or to do an extra couple reps at the gym, or to spend an extra 5 minutes really connecting with a client who is struggling - then you have embraced a push equilibrium. The benefit to embracing a push equilibrium is made clear by Darren Hardy in his book The Compound Effect, where he shares that “Small, Smart Choices + Consistency + Time = RADICAL DIFFERENCE”. Success is a function of consistent, incremental gains. The same way that you can’t go to the gym once a month for 10 hours, neither can you pull an all-nighter every so often and forego consistent daily progress. What get’s scheduled, get’s done. What doesn’t…might. Being bold in business and life is about drawing a line in the sand, and putting a date on the calendar for when you will accomplish your goals. Otherwise it is just too easy for the the urgent to overtake the important. Even the best intentions can be sidelined when the pace of life introduces new options and opportunities or headaches and hassles. Scheduling your most important, big bold goals first and committing to them with people you trust holding you accountable is the way to keep your dreams top of mind, and top priority. Pro Tip: Keep a yearlong calendar on your desk and pencil in the events, trips, product launches (and vacations) you’ll take this year. Look at it many times throughout the day to deeply embed these goals in your subconscious. The primary distinction between a leader and someone being lead is that the former makes decisions and the latter executes them. Therefore, the heart of leadership is making choices and determining decisions. With the decision made, a course can be charted and traversed by others - and they may demonstrate leadership in making the many decisions necessary to succeed in doing so. The absence of leadership is indecision and spinning in the realm of possibilities and potential indefinitely. We only have a finite amount of thought energy to process decisions each day, so one of the key determinants in being a productive leader is the ability to quickly assess the available options, weigh the potential costs and take action. How many people do you know who love to give, that honorably want to be of valuable service to so many…and always seem to be struggling financially? Indeed it is both noble and necessary to provide valuable service to customers and clients in order to have a successful business. But while there are countless training programs, certifications and degrees that prepare us to give, there are precious few on how to receive. Being clear on your goals and taking responsibility for all that is required to reach them (Distinction #1) is a necessary but not sufficient to achieve them. What is required is to be open to receive and eradicate any hidden shames, insecurities or judgements around succeeding, winning and accumulating assets. Start to become aware of any stories or looping thought patterns you notice that preclude receiving in abundance. Try to identify the moment in your thoughts where you go towards a negative outcome, and redirect it towards infinite possibility.